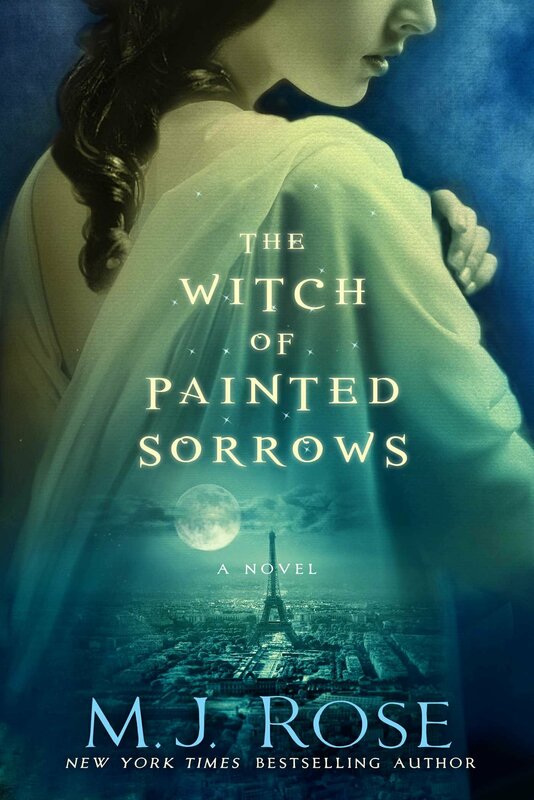 This is my first foray into the decadent, luscious, powerfully enigmatic world of a MJ Rose novel, and the historical ghost drama, The Witch of Painted Sorrows, lives up to the high expectations I had about her novels. This is based on the many people I know personally that have recommended her novels, and the fact I also had the opportunity to hear her speak in-depth about the craft of her writing at the yearly Thrillerfest convention in New York City. Her contributions to a panel on the supernatural elements of thriller fiction were fascinating, and MJ Rose elaborated on how her own research into the esoteric metaphysics that exist on the fringes of our natural world inspire her to write stories in a bygone era, where this supposed nonsense had much more traction in the popular media. Of course, there is still a certain allure to this sort of stuff, especially on New Age-themed television programs, but we don’t really attach too much serious thought or consideration of the invisible world of the nonsensical, fringe new-age spirituality. As such, having The Witch of Painted Sorrows, a book that is enmeshed in this form of metaphysics, including alchemy, magick, in a world becoming more rational in its scope, provides an interesting structural device for the story’s setting. Basically, this fading metaphysical interest works in opposition to the sturdy, rigid frame of the world of modern architecture, evolving scientific knowledge, and the stirrings of psychology by the last few vanishing years of the nineteenth century. All these things are avidly featured in many areas of this novel, since it is set in late nineteenth century France, where again the metaphysical knowledge of the world is becoming more esoteric, even with its fleeting popularity among some people at this time. And the story centers on a woman named Sandrine Salome, escaping from crumbling marriage, who has decided to return back to Paris,France, to live with her grandmother, who works as a courtesan in France, a more esteemed form of “prostitution” (that really is more professional, respected in France at this time). In this early portion of the story, the novel mentions that she is deeply shaken by the recent death of her father, and the involvement that her traitorous husband had in the demise of her father. To Salome,these tragic parts of her immediate past lends to a certain vulnerability and openness to the influences of the bustling metaphysical world around her in Paris. Naturally,some may find the early portions of the novel, describing Sandrine’s adjustment to the energetic, thriving world of late nineteenth century Paris to be interminable, but MJ Rose’s elegant, subtly-expressive prose consumed my attention from the get-go. Also, the ease with which MJ Rose alternates between the introspective look at Sandrine’s many thoughts, during the early scenes of the novel, along with the emerging supernatural mystery at the heart of the novel, allows for the reader to really sympathize with the main character greater in the midst of scenes where the supernatural mystery is palpable. This type of balance is very hard to strike, being able to smooth the precision between being sure to provide introspective development on the main character, the accompanying side character. All the while, you also have to be sure to construct the building drama/literal action of the narrative. MJ Rose excels in balancing all of this with a certain degree of narrative balance, while also providing rich descriptions of the various houses and structures featured in the story’s enchanting Parisian setting. My biggest problem with the story, though, was that Sandrine and her grandmother’s were developed very well, but the love interest Julien Duplessi who comes onto the scene eventually in the novel feels comparatively hackneyed. Oddly enough, it almost feels like his less interesting personality and backstory emphasize just how well-developed Sandrine’s character is. Julien is a mediocre, slightly interesting character at best, but he does come across slightly as a bit of boring, pretty-face, sensitive architecture, who often does not seem to have a very established, individualized sense of his own character, besides how he has nothing but consummate love and adoration for Sandrine. Of course, his adoration is tempered by a later affection for a rich French opera singer, who he wishes to be wed to, and this creates some forced level of depth to his character, except the opera singer feels like a throwaway, forgettable, vapid caricature, rather than an interesting foil, perhaps, for Sandrine. Sometimes, I felt like the way that Sandrine quickly develops artistic abilities, due to some supernatural intervention in the form of a beautiful, though slightly mysterious ruby necklace (that cannot easily come off) felt also like it could become dry or dull over time. Initially,the way she quickly adjusts and enters into the art school, as the first female student, initially, also comes off as feeling contrived, but her growing artistic skills, coupled with her burgeoning lust and love for Julian do provide a riveting sense of mystery, as to just how much influence the ancient spirit La Lune of her grandmother’s house has over her drastic transformation into a demurring, respectable nineteenth century model of feminine purity, and a woman that recognizes her sexual proclivities as a refining gift of her life, as well as the growing awareness of the rapture that comes with delighting in creating artistic creations. It is this powerful feminist thread of the story, which is deeply psychoanalytic at its core, that really allowed me to overlook the shortcomings of the novel, mentioned above, and greatly appreciate the trenchant observations MJ Rose makes on the internal conflict that women of this time had to fend with within themselves. Their society provides them certain established, though diametrically opposed roles, and this is clearly presented at the beginning of the novel, with how the grandmother can liberally enjoy a lascivious lifestyle as a courtesan, yet still be a respected member of the elite part of society. Of course, the irony is that her money still comes solely from male admirers, as such she is still metaphorically subservient and economically dependent on men in some way. Both Sandrine, and the ghost that has haunted the female family members ever since the time in history where La Lune, the jealous lover, but skilled artist lived. She is the vengeful spirit of the grandmother’s home, who couldn’t function in the end without impetuously garnering energy and power through all that she did, in a way to fight the system that has long suppressed her and made her use her power in accordance with the dictates of the masculine power structure. Sandrine’s journey becomes frightening, thrilling, but ultimately destructive, in that the insatiability she feels is much too overweening, too extreme in its wanton caprice. She wants to be eminently skilled in the arts, but she also wants to completely dominate the relationship, in a sense, that she has with Julien. Perhaps, his slightly diminished personality, which I wrote off earlier in this review as being subdued, is supposed to be a purposeful counterpoint to Sandrine’s powerful personality. If we see his character as being developed in that way, I can definitely gain some appreciation to the way that this story is meticulously shaped into a nuanced, beautiful, though intense metaphor on the intense need and desire women, suppressed too long by a patriarchal structure that sees any healthy expression of power and strength as “insane”, felt throughout history, and how it finally cracked in many ways for some, especially as society progressed. And we see, through Julien, just how much this can suppress relationships for both genders, in that there is no equal distribution of power between both lovers, as both are dealing with the baggage of a patriarchal society. We are not supposed to see Sandrine’s torment as something entirely positive, but complicated, and that once again shows the skill of MJ Rose as a writer. Any discussion that was prompted by the events of the narrative in The Witch of Painted Sorrow are uniquely my own thoughts because this story forces us to uncomfortably debate the psychological depth of power, feelings of jealousy, betrayal, vengeance, and how being too active and confident, in a rebellious, overweening sense (a power overdrive, so-to-say) can be extremely toxic and damaging to both you and the people around you. This paradox of creation and destruction, two mutually exclusive forces within and without ourselves, manifests clearly in the way that the artist feels a destructive flood of feelings, which they must fight to siphon into a controlled, though vivacious, powerfully emotive/absorbing piece of artwork. And Sandrine’s art animates those forces within herself, the caprice of the spirit of La Lune, mixed with her own growing sense and need for defiance, after a past where she has suppressed her ardent love and need to create art, and find herself, in the name of conforming to the patriarchal structure of her society. While ostensibly being a historical ghost drama of sorts that is very haunting and riveting at times, MJ Rose’s The Witch of Painted Sorrows, from Atria Books (an imprint of Simon and Schuster, who publish a wealth of excellent novels) is a book that any fan of books with psychological suspense, depth, and intrigue, with a rich historical fiction setting, will greatly enjoy! DOWNTON ABBEY TEAS, FROM THE REPUBLIC OF TEA. While these teas might not be perfectly matched to the tensions and high emotions/drama of this particular novel, I strongly felt that these teas are still wonderful, flavorful blends that are great accompaniments to this particular novel. 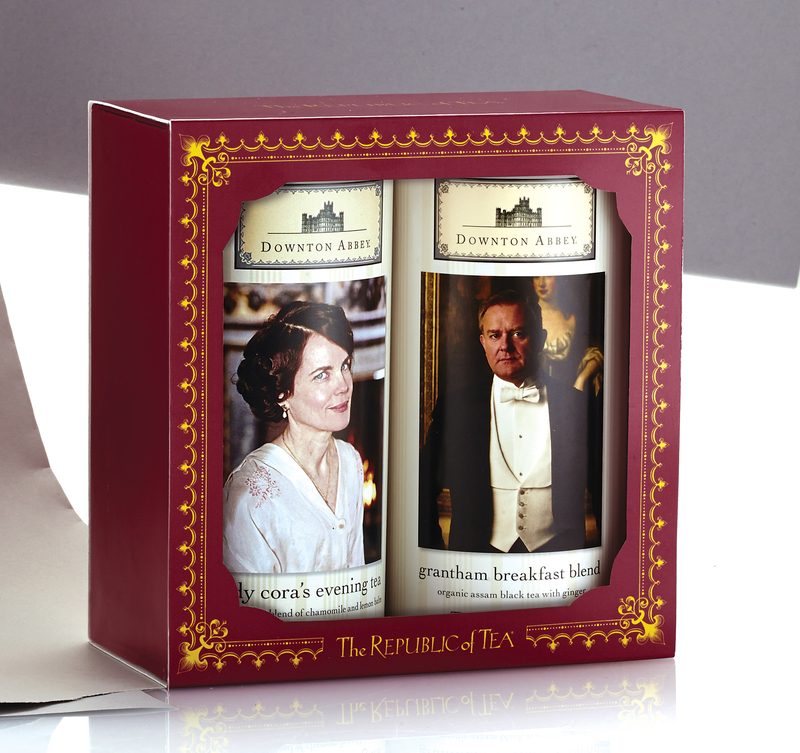 They are both part of The Republic of Tea’s special Downton Abbey Tea Collection, and I originally saw them at a tea store late last year. Being a big fan of the BBC costume drama, I always felt a strong tug towards wanting to try them for myself. Sadly, the two books I wanted to pair these with didn’t quite work out. They happened to be Cavendon Hall and the recently-released Cavendon Women by: Barbara Taylor Bradford. I have the one novel, which I will be reviewing at a future date, but I never received the copy of Cavendon Women I had originally planned to have read/reviewed by this point. The important thing is that I can still proudly feature both the Grantham Breakfast Blend and Lady Cora’s Evening Tea as literary tea recommendations to be matched with this book. In many ways, the late nineteenth century European setting of MJ Rose’s The Witch of Painted Sorrows may appeal to fans of Downton Abbey, though there is a stronger, atmospheric Gothic element to this story that isn’t the bucolic, English countryside setting of the series Downton Abbey. Nonetheless, I really like the opposing dimensions of both these teas, which seem to match the personalities of Lord Grantham and Lady Cora very well. Oddly enough, when comparing both these teas-one being a robust black tea blend and the other being a sleep-inducing, refreshing herbal blend- I noticed that both teas describe the spectrum of the growth and evolution of Sandrine Salome’s personality in The Witch of Painted Sorrows. For instance, Lady Cora’s Evening Blend very much matches the pedestrian, slow, almost deceptively calm/sedated mood of the beginning of the novel, where we feel that the book itself, along with the character of Sandrine Salome, will be traditional, European drama tropes in a story that will be very absorbing, but also be purposely drawn-out as a story. This tea combines a bevy of different notes of very different herbs, including skullcap, valerian root, lemon balm, chamomile. All these things suffuse your senses with the same initial comforting chills of familiarity Sandrine feels when she first walks near the house that her grandmother owned, and she wistfully recalls the first tragic love affair she had as a young girl. In the same way, this relaxing tea made me feel like memories I had of the past were dredged up, and unfolded, slowly, in a peaceful, dreamlike way. Grantham Breakfast Blend is a robust, strong, impressionable Organic Assam Black Tea blend that has a very distinctive flavor that is neither tart, but it has its own slightly sweet taste, semi- spicy Ginger root flavor that is neither harsh in its strength, but nonetheless has the ability to linger in your mind long after you taken your first sip. When Sandrine first places the necklace, found in her Grandmother’s well-decorated, opulent house, she feels a strongly course of soaring strength overtake her. When I was drinking this tea, I felt that same strength and flash of energy hit me with a very good feeling of attentiveness to what exact changes were being effected onto the character of Sandrine, and also the very alluring, haunting, dangerous world of the metaphysics/magicks that come onto the scene of the story. For any intense character/costume/historical fiction drama, stricken with relentless energy and absorbing character study, both these teas, inspired by the most popular BBC drama in contemporary times, would be a great match, if you decide to settle down to reading either this book or something along the same lines of it! This is on my TBR pile, and I’ve been waiting to read some thoughts on it. Very nice review. It sounds like the kind of thing I’ve been craving in my speculative reading as of late. I think this just made me want to bump it up my TBR list.